Popular music doesn’t always make for the best music. There are plenty of multi-platinum records out there that quite frankly, aren’t worth listening to. Today’s band has been has been making music since the late ‘80s, and outside of the featured album, haven’t generated a ton of accolades—but they’re a solid group. It was the late ‘80s in Fort Worth, Texas, when singer Vaden Todd Lewis was looking to form a band. After finding a bassist, lead guitar and a myriad of drummers, the new group was on its way. 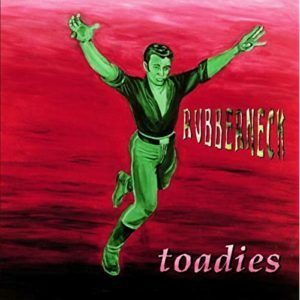 Calling themselves Toadies, they played shows all over Texas and began creating a small following. They decided to self-release a handful of cassette tapes, one being an EP called Pleather in 1993. Their good fortune was about to pick up, as one of the singles off the EP began making rounds with the fat cats in the industry. Months later, they were signed to Interscope Records. The label indicated they should hop into the studio immediately and begin work on a new album. They wanted the Toadies sound to be “distinctly grunge” and “distinctly Texan.” Since I don’t really know what that means, I was curious to dive into the record and see if they achieved the label’s goal. 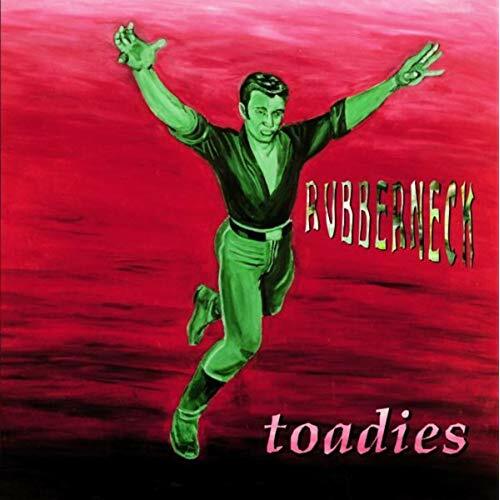 Today I’m listening to Rubberneck, released in August of 1994. They attempted to push one single on major radio prior to the album dropping, but that flopped and not a ton of buzz was generated going into the release. The first week was a bit slow, but they played their ace in the hole and released the major single “Possum Kingdom” on both radio and the music video on MTV. The single was such a smashing success, the album reached RIAA gold status fairly quickly and platinum status after roughly one year. It also, years later, would be a featured track in video games like Guitar Hero and Rock Band. There is a neat documentary (it came out around 2004 for the 20th anniversary of the record) out there about the band and the song called “Dark Secrets: The Stories of Rubberneck”. It’s an interesting watch if you’re a fan of the band or the tune. The album itself would end up charting in the Billboard 200 and the singles would rocket as high as #4. They would end up touring through the ‘90s with a who’s who of rock band: Red Hot Chili Peppers, White Zombie, and Bush—just to name a few. In terms of the sound or style, it’s pretty distinctly grunge in spots, capitalizing on the movement happening in the mid ‘90s. I’m not sure how “Texan” it sounds, but the funky guitar and catchy riffs will certainly leave you wanting more. It’s got a pretty big punk feel to it, which was a bit different at the time and makes Toadies stick out to me, even today. In addition to the documentary, they re-released a 20th anniversary special edition of the album with a few previously unreleased tracks. Rubberneck is relatively short, coming in at just under 40 minutes, but it’s engaging and toe-tapping the whole way through. A couple tracks have worked their way into my regular rotation over the years, and listening to the full record today for maybe the first time ever, a couple more are going to be mainstays as well. For an album that I’d guess most folks reading the blog today haven’t ever heard of, I think you’ll be pleasantly surprised with what’s coming out of your headphones. Toadies are still out there, grinding and making good music for their fans. They took a hiatus from 2002-2006 or so, but since then have been rocking into modern music history. Don’t be a quitter and pick this one up today, it might just blow you away. Happy Tuesday!